A well-designed and positioned vegetative buffer on a poultry farm can be used as a practical air emission mitigation technique. It not only provides a means of filtering and disrupting air transport downwind but also adds appealing landscape to the facility, demonstrating producers’ environmental stewardship. A tree buffer alone is unlikely to solve the air quality issues, but it may provide producers with one more tool, used together with other best management practices, to reduce the environmental impact of operations. Contact the local Soil Conservation District or University of Maryland Extension for assistance. 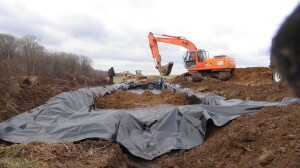 Site preparation includes one or more of the following: plowing, spraying, disking; while tree establishment includes purchase, planting, mulching and watering. Animal agriculture faces increasing environmental challenges related to air and water quality. Ammonia and other emissions from poultry houses are commonly cited as air quality concerns, while dust and odors are at times considered nuisance issues for downwind neighbors. Dust particles can adsorb and transport substantial amounts of odorous compounds and ammonia. These buffers can make for good neighbors as well as environmental quality improvements. The practice is currently promoted and being implemented with Farm Bill cost-share incentives. Costs for vegetative tree buffers are highly variable and site/design specific. The three categories of expenses are (1) site preparation costs (plowing, spraying, disking), (2) tree establishment costs (purchase, planting, mulching, and watering) and (3) long-term maintenance costs (replanting, weed and pest control, irrigation). Most the total cost is upfront and is tied to the cost of the initial planting stock. Older, larger nursery stock can be considerably more expensive than bare-root seedlings, but this higher investment may “buy time” during establishment. The long-term maintenance cost will be associated with how hardy and well-suited the plants are for the site. Native plant stock well-suited to soil types and conditions are recommended.